Definition: Rabies is a viral infection that mainly spreads through a bite from an infected animal. It is an RNA virus of the rhabdovirus family. It is spread when an infected animal scratches or bites another animal or human. Saliva from an infected animal can also transmit rabies if the saliva comes into contact with the eyes, mouth, or nose. The term is derived from the Latin rabies, “madness”. This, in turn, may be related to the Sanskrit rabhas, “to rage”. The Greeks derived the word lyssa, from lud or “violent”; this root is used in the genus name of the rabies virus, Lyssavirus. 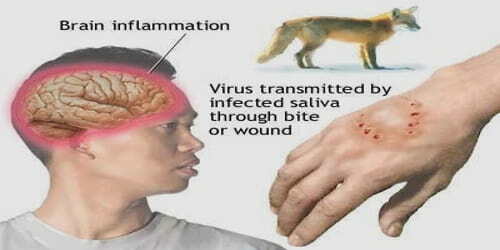 Rabies is caused by a virus that affects the central nervous system, particularly causing inflammation in the brain. Domestic dogs, cats, and rabbits, and wild animals, such as skunks, raccoons, and bats, are able to transfer the virus to humans via bites and scratches. The key to fighting the virus is a quick response. Globally, dogs are the most common animal involved. More than 99% of rabies cases in countries where dogs commonly have the disease are caused by dog bites. In the Americas, bat bites are the most common source of rabies infections in humans, and less than 5% of cases are from dogs. Rodents are very rarely infected with rabies. The disease can only be diagnosed after the start of symptoms. 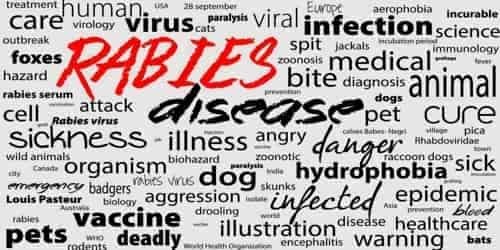 Diagnosis and Treatment of Rabies: Rabies can be difficult to diagnose, because, in the early stages, it is easily confused with other diseases or with aggressiveness. The reference method for diagnosing rabies is the fluorescent antibody test (FAT), an immunohistochemistry procedure, which is recommended by the World Health Organization (WHO). 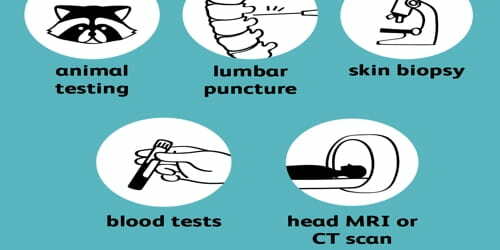 Lab tests may show antibodies, but these may not appear until later in the development of the disease. The virus may be isolated from saliva or through a skin biopsy. However, by the time a diagnosis is confirmed, it may be too late to take action. For this reason, the patient will normally start a course of prophylactic treatment at once, without waiting for a confirmed diagnosis. The differential diagnosis in a case of suspected human rabies may initially include any cause of encephalitis, in particular, infection with viruses such as herpesviruses, enteroviruses, and arboviruses such as West Nile virus. The most important viruses to rule out are herpes simplex virus type one, varicella zoster virus, and (less commonly) enteroviruses, including coxsackieviruses, echoviruses, polioviruses, and human enteroviruses 68 to 71. Once a rabies infection is established, there’s no effective treatment. Though a small number of people have survived rabies, the disease is usually fatal. If a person is bitten or scratched by an animal that may have rabies, or if the animal licks an open wound, the individual should immediately wash any bites and scratches for 15 minutes with soapy water, povidone iodine, or detergent. This might minimize the number of viral particles. After exposure and before symptoms begin, a series of shots can prevent the virus from thriving. This is usually effective. A fast-acting dose of rabies immune globulin: Delivered as soon as possible, close to the bite wound, this can prevent the virus from infecting the individual. 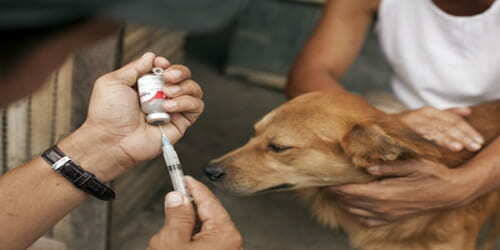 A series of rabies vaccines: These will be injected into the arm over the next 2 to 4 weeks. These will train the body to fight the virus whenever it finds it. 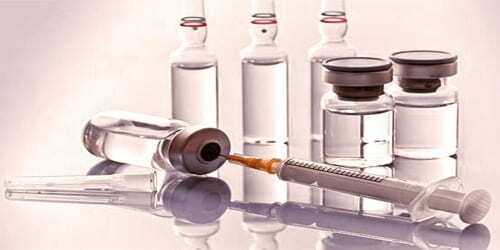 The pain and side effects of modern cell-based vaccines are similar to flu shots. The old nerve-tissue-based vaccinations that require multiple painful injections into the abdomen with a large needle are inexpensive but are being phased out and replaced by affordable World Health Organization intradermal-vaccination regimens. Intramuscular vaccination should be given into the deltoid, not the gluteal area, which has been associated with vaccination failure due to injection into fat rather than muscle. In infants, the lateral thigh is recommended. Prevention: Rabies is a serious disease, but individuals and governments can and do take action to control and prevent, and, in some cases, wipe it out completely. Protect small pets from predators. Report stray animals to local authorities. Keep bats out of our home. Consider the rabies vaccine if we are traveling. If bitten by an animal, washing the wound with soap and water for 10 to 15 minutes and contacting a health care provider to determine if post-exposure prophylaxis is required.